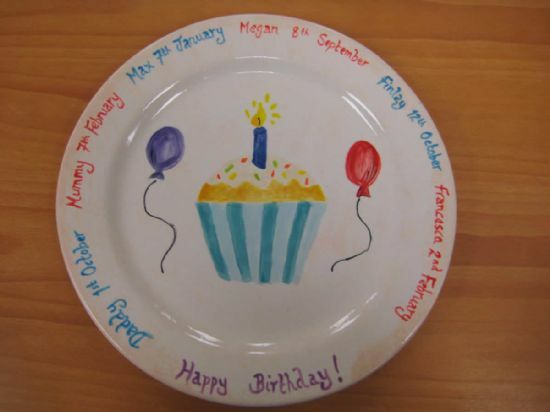 Mandy made this Family Birthday plate, with each family member's birthday around the edge, to use whenever there's a birthday in the household. What a great idea! 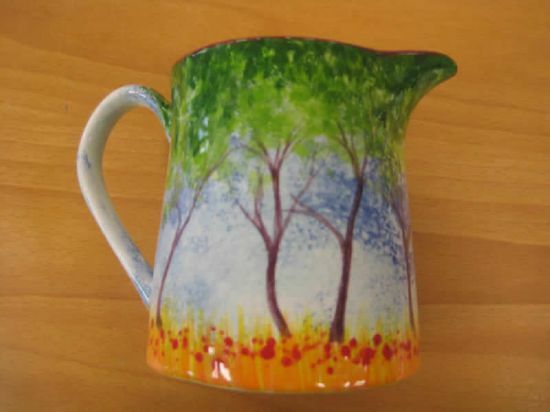 This great teapot was a first attempt by a young lady for her Dad Pat(rick)it depicts their farm, in Australia and now lives there. 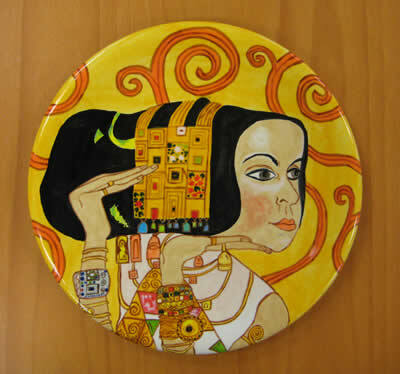 Diana painted this house-name plaque for her parents. 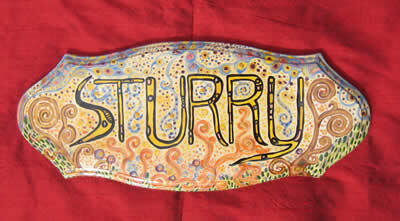 Sturry is the name of the wood where they courted and fell in love, and now the name of their house. You can make such very personal gifts by painting pottery. 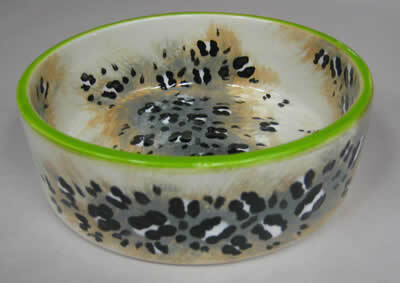 Ruth painted this pet bowl for her kitten Ziggy. 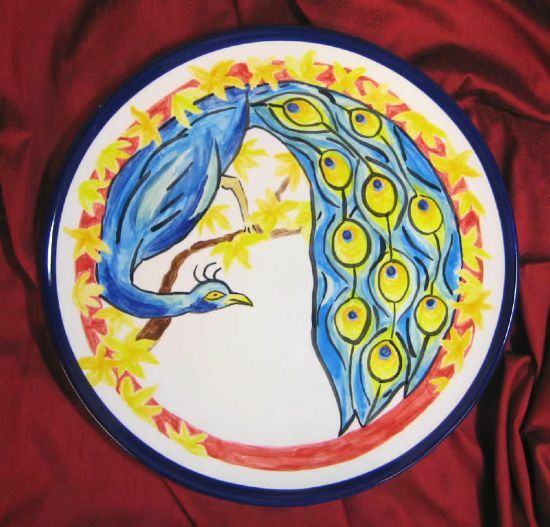 The design comes from one of the many ceramic-painting design books that we have in our studio, to provide extra inspiration. Ed is one of our most talented customers and his work is always superb. 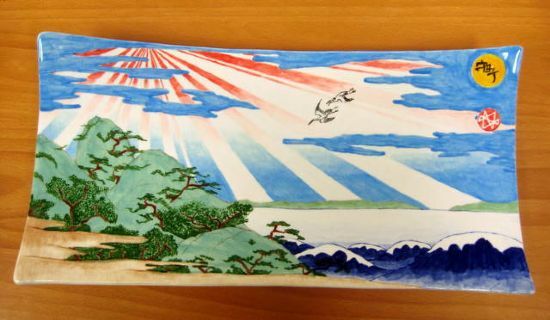 This sushi platter, in a Japanese design, is just wonderful. 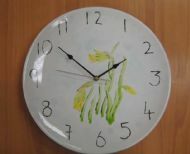 Helen made this beautiful daffodil clock as a gift for her Mum. 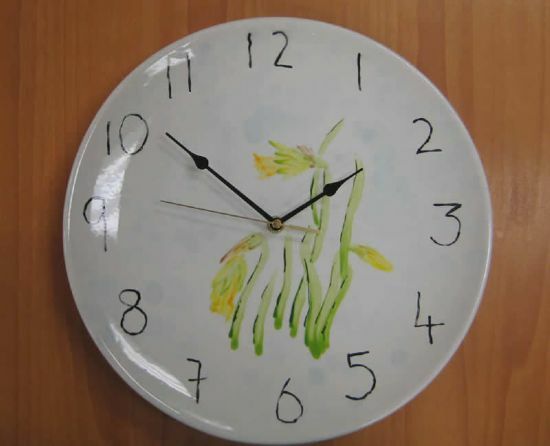 You just do the pottery-painting, then we fit the mechanism to turn your piece into a clock - it's that simple! Becky and her family come to Glazydayz every year, when they take their annual holiday in the area. 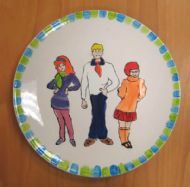 This time she painted a series of Scooby Doo plates, including this one. Believe it or not she's only ten! 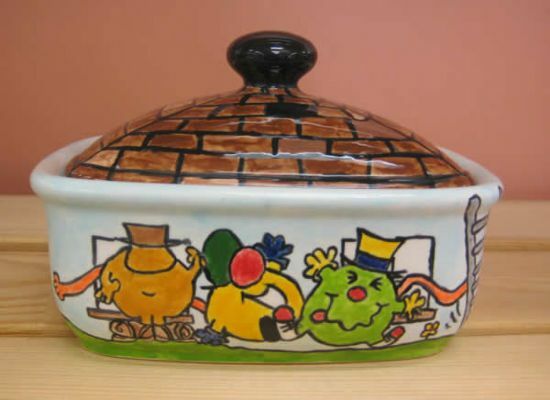 Stuart's Mister Men butter dish was much admired by other customers while he was working on it. 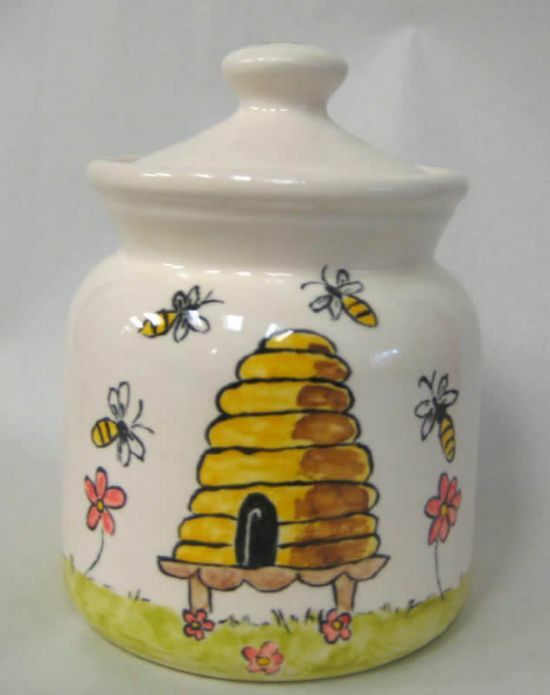 We could have sold it a dozen times over! 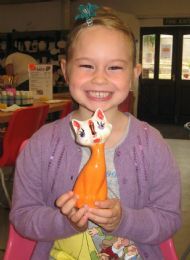 Iris is rightly delighted with the beautiful cat that she painted! Margaret came to Glazydayz on her birthday, as a treat. 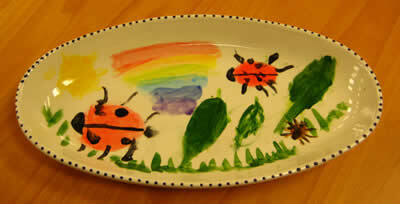 She'd never painted pottery before but look at what she did..... and believe it or not it was on her 84th birthday! 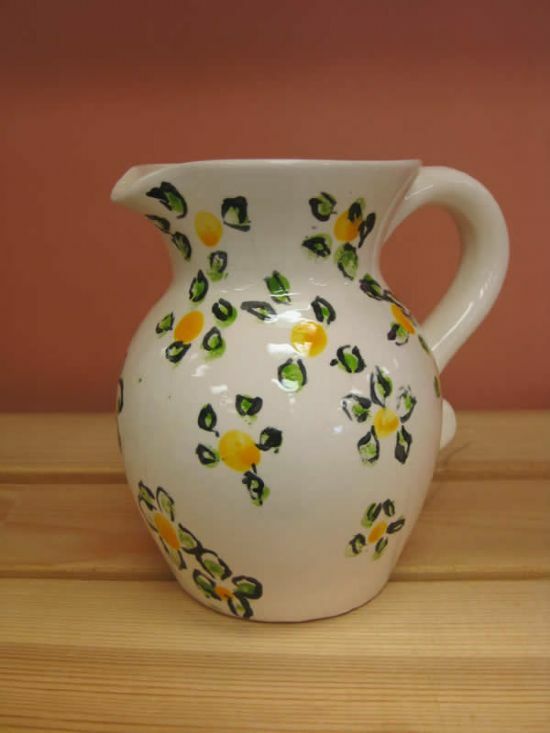 Neville was visiting the area on holiday when he painted this gorgeous jug. It now lives, with him, in Lincolnshire. 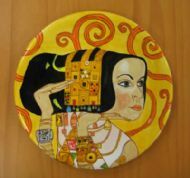 Emily's Klimt-inspired plate is one of our all-time favourite pieces. 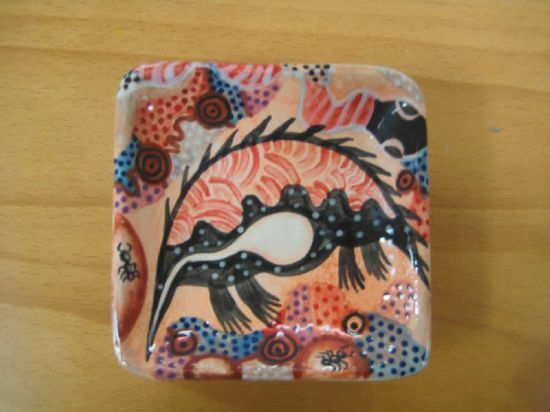 Emily loves detail and sometimes works with a tiny brush that has only a single bristle. We call it The Emily Brush! 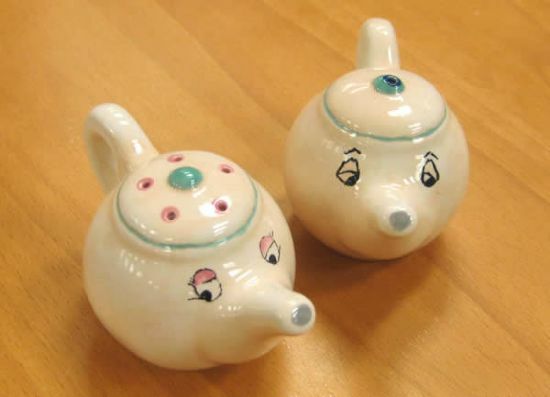 Karen had the great idea of painting this teapot-shaped salt and pepper set, in the style of Disney's Mrs Potts from Beauty and the Beast. 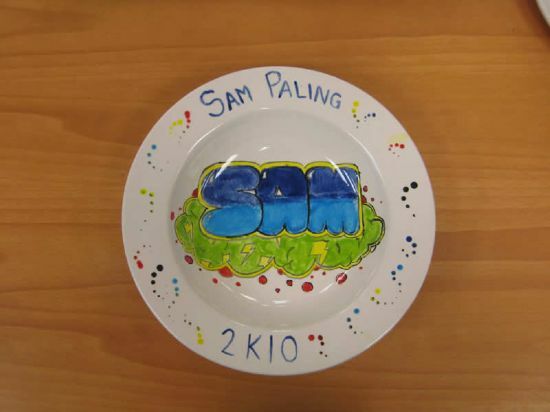 Sam comes regularly with his Mum and he likes to paint vibrant, colourful, designs. We think he could make a career of it, he's such a great ceramic painter! Pam is one of our most regular customers and she travels all the way from Cheltenham to come and paint pottery with us each week. 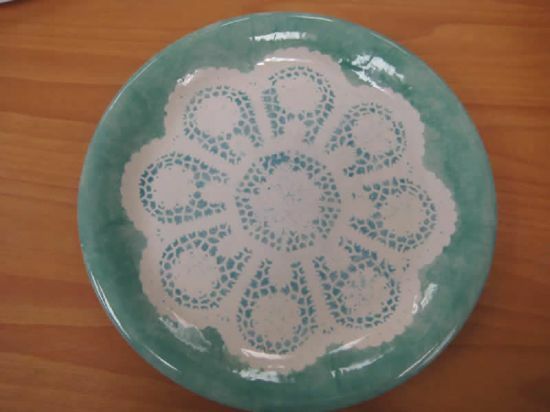 She had the great idea of painting a plate through a doily, so now she has a plate with a doily permanently on it! 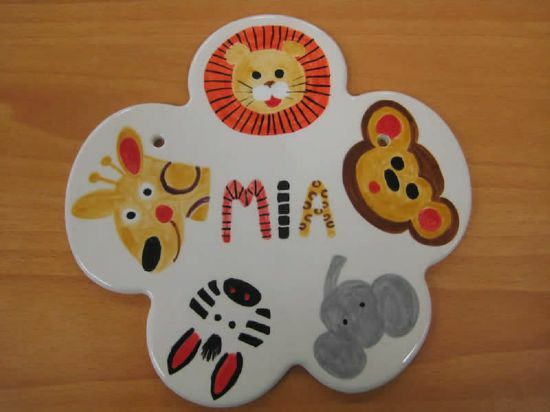 Jenny painted this plaque for her granddaughter, copying the animals from the cushion fabric in Mia's bedroom. 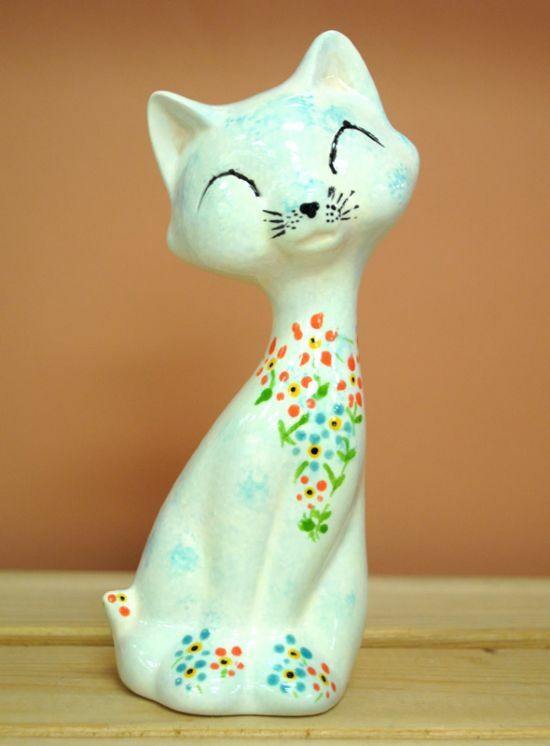 The floral design that Jill painted onto this pottery cat makes it completely unique - and very lovely! 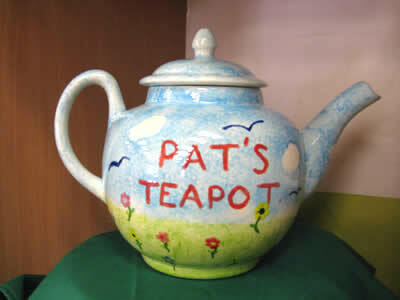 Kirsty asked her friend Michelle what she'd like Kirsty to make for her as a gift. 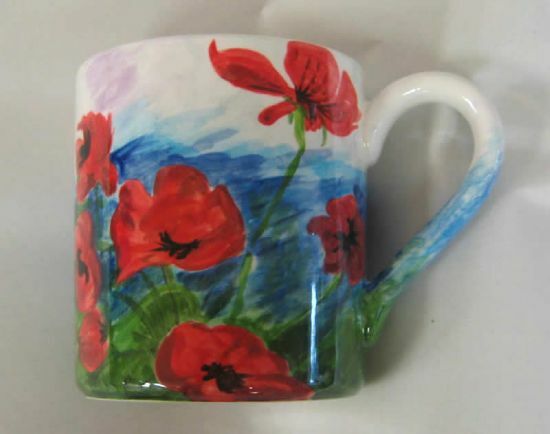 Michelle asked for a mug with flowers on it, and Kirsty painted this stunning poppy design for her friend. Lucky Michelle! 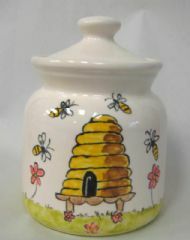 We love the design that Karen painted on this lidded jar, making it very clearly a honeypot! For about 15 years, Hannah has been promising to give her godfather something that's she's made herself, as a gift. During that time she's written him countless I.O.U.s! 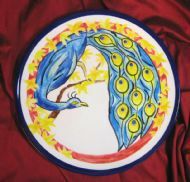 She's finally fulfilled her promise with this stunning peacock plate. We don't think he's going to be disappointed! 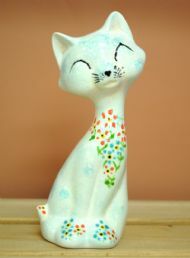 Jane loves doing detailed work and she used a technique called "scraffito", which involves scratching into layers of paint to reveal the layer below, to create this exquisite piece. 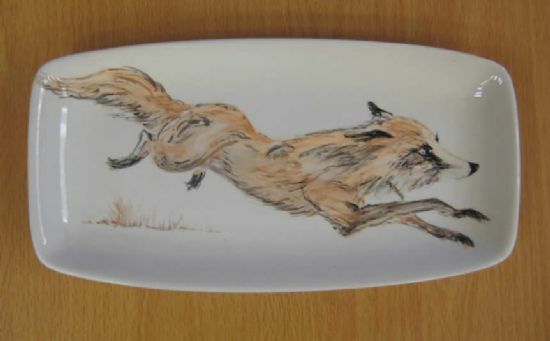 The arty gene clearly runs in the family, as Hannah's Mum Anne painted this running fox on a nibbles dish. And what an extremely handsome fox he is too!